Two construction drills broke through into a railway tunnel in east London on a busy First Capital Connect route. Services on the Moorgate to Finsbury Park route were stopped after a driver said muddy water had poured on to his roof near Old Street Station. An hour later, at about 11:00 GMT, two piling drills came through the tunnel wall as a train with only a driver and Network Rail manager approached to inspect the area. The train operator said a "serious incident" had been averted. 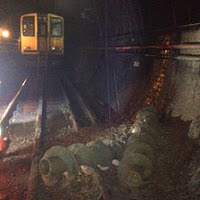 The route on the Northern City line was closed after the incident on Friday morning and will remain closed over the weekend during investigations and while the damage is repaired. British Transport Police has visited an office construction site located above the tunnel. First Capital Connect managing director Neal Lawson said: "This was a serious incident that could have ended very differently had it not been for the vigilance and prompt reporting and actions of our drivers. "We carry two million people a year on the Northern City Line and whoever is responsible for this must be held to account." Network Rail route managing director Phil Verster said: "Our engineers are on site assessing the damage and we will restore the railway as soon as possible." It is expected that the route will reopen on Monday.